Mumbai: On the occasion of the 5th birthday of conjoined twins Riddhi-Siddhi, Bai Jerbai Wadia Hospital (BJWHC) today added 20 ventilators in the NICU. The addition of ventilators makes BJWHC the largest pediatric hospital in Asia having 70 standalone ventilator beds. This is expected to address the gap of the long waiting list of patients due to non-availability of ventilators in the city. Around eight lakh newborn babies succumb to death every year in India. Over 35 lakh children are estimated born prematurely (before 37 weeks of gestation) in India as per WHO reports. More than three lakh infants die every year even before completing a month. Data suggests that over 3,500 premature infants die every year in the city’s hospitals. The city of Mumbai suffers with the acute shortage of the Ventilators which forces patient’s relatives to rush from one public hospital to another in the search for a ventilator support. 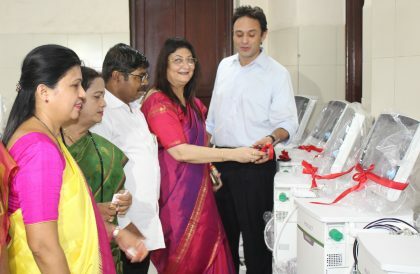 Dr Minnie Bodhanwala, CEO of Wadia Hospitals said, “Despite being the largest NICU care facility in the world we cope with the challenges due to lack of Ventilators. Sick babies are received from all over Maharashtra and many other states for critical care treatment. In the current scenario of Pediatric care in Mumbai, Corporation has three super-speciality hospitals, five speciality hospitals and 16 secondary-level hospitals, which has approximately 1,000 intensive care unit beds. Of these only 457 beds having ventilators.